Applied to the soil, SP-1 supplies and stimulates diverse soil microbial life. It also improves soil tilth and health. Sp-1 is a naturally derived broad spectrum microbial with additional specific beneficial organisms added during the stabilization process. 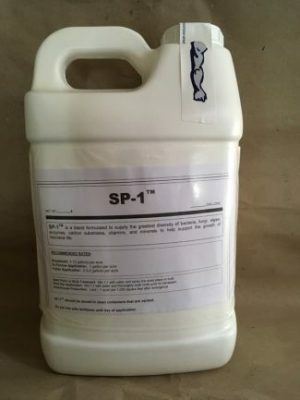 SP-1 enhances the productivity of soils by improving the bacterial profile of the rhizosphere. It can be used with rhizobial inoculants and as an in furrow seed treatment – see label for any restrictions. Beneficial for all soils and crops. Functions as a biological soil conditioner, enhancing the rhizosphere environment through microbial action. SP-1 should be stored in clean containers that are vented. Do not mix with fertilizers until day of application. Use on vegetables and fruits (esp foliar applications) is restricted by manufacturer (see supplemental information from manufacturer label).